Essays and articles written for magazines on the horror genre and other topics. These have never been collected together and many are nearly impossible to track down. Furthermore, from Barker's personal archives: a couple of unpublished pieces, including an unused self-penned introduction to Volume 1 of the BOOKS OF BLOOD from 1983 written from the point of view of a demon interviewing Clive Barker. 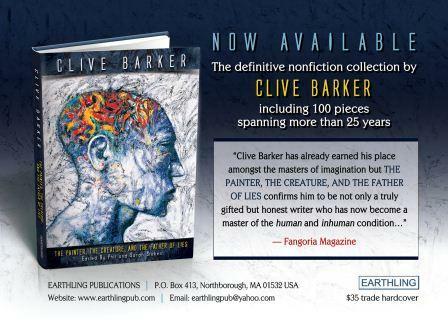 If you haven't read any of Barker's nonfiction, you'll find that it's just as compelling, enjoyable, and well-written as his fiction. These pieces cover the inspirations for his works, insights into the creative process, and musings on art and the horror genre. Not currently scheduled to be published anywhere else, don't miss this landmark collection from a modern master of horror and dark fantasy.